A brochure has been created to help local groups conduct outreach activities. Each of the meetings are listed in the brochure and other details of Nicotine Anonymous are presented as well. Please feel free to print these out, fold some up, and get them distributed to areas around town. We are looking for anyone interested in helping to reach the still suffering nicotine addict in Minnesota. We need help with outreach to libraries, coffee shops, Alano clubs, medical offices, and other locations where nicotine users may find our message. If you would like to join our group and the outreach committee, please join us Tuesday evenings at 7:00 at 1330 Blair Avenue in St. Paul. The Minnesota groups recently hosted a table at the Tobacco Dependence Treatment Conference on May 21st and 22nd. We provided medical professionals with several resources to share with their patients to help them get through life nicotine free following the treatment programs prescribed by their medical professionals. Take a look at the booth that we set up. The tablecloth is available for others to use across the Nicotine Anonymous fellowship. Print a flyer that can be posted on bulletin boards and other locations to announce the Minnesota NicA phone number and location of meetings. 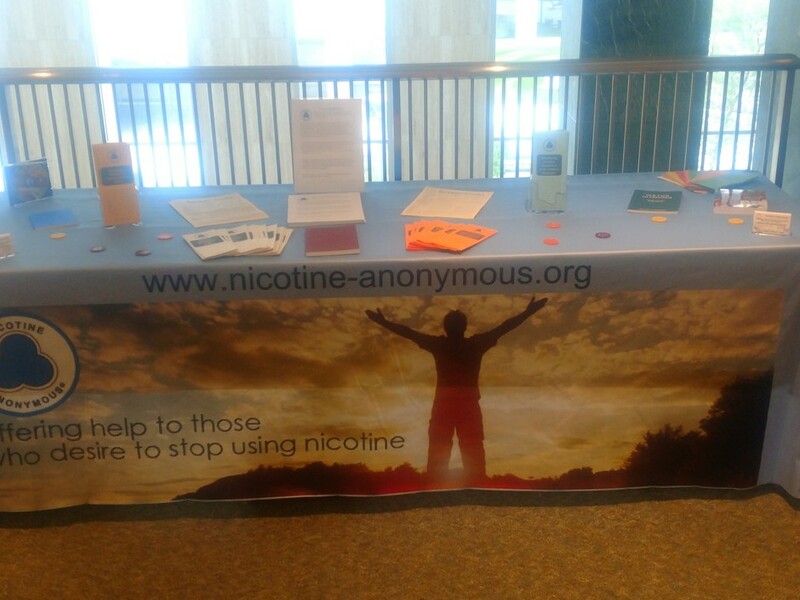 See the outreach materials at Nicotine Anonymous World Services (NAWS) to continue to help spread the message.